Room rentals can now be booked online via LiquidSpace. The home page of LiquidSpace, which shows the rooms at Lake-Cook Reporting available to rent. Lake Cook Reporting now accepts online reservations for our suites in Bannockburn, IL near Deerfield in Chicago’s north suburbs using LiquidSpace online room rental service. LiquidSpace is a fast-growing online booking application for clients to find meeting spaces and conference rooms across the country. Lake Cook Reporting’s involvement in the service makes booking with us even easier. Clients looking for a rental room only can view real-time availability of our conference rooms, pricing for hourly/daily rentals, and instantly book online. Pair your rental with a TV, videoconferencing, and more right from the booking form and we’ll have it set up for you. Prospective clients can view photos and details of all four conference rooms online, browse our offered amenities, and schedule a meeting space online. We offer fully furnished conference rooms with all the expected amenities like coffee and water. We also provide HDTVs in all of our rooms, perfect for presentations, video calls, or anything else. Free Wi-Fi provided to all guests for use on any of your wireless devices. Rooms can be rented by the hour, half day, or full day, and payments can be made by credit card online through the website. We offer free deposition suites when booking our court reporters through our website scheduling page. Need to cancel? LiquidSpace offers full refunds if cancelled more than 24 hours beyond the scheduled start time. Note: if you’re booking a deposition, we provide conference rooms free when using our court reporter at our scheduling page. Book online with us today by visiting Lake-Cook Reporting’s rental page. 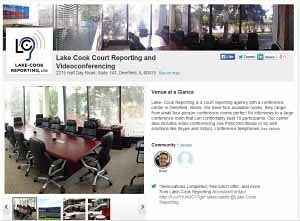 As always, bookings for depositions, court reporters, and videoconferences can still be booked by phone at (847) 236-0773, by email at info@lakecookreporting.com or at Lake-Cook Reporting’s online scheduling page.